Gummybear International Launches New Spanish Language Website for Animated Gummy Bear Character Gummibär - Gummybear International Inc.
Gummybear International, parent company for Gummibär, everyone’s favorite singing and dancing animated gummy bear, is proud to announce the launch of an all new Spanish language fan website developed specifically for the Central and South American markets. Teaneck, NJ – March 8, 2012 – The animated singing and dancing internet star known as Gummibär has come a long way since his humble beginnings with a 30 second clip on YouTube in 2006. Today the character has dozens of music videos, which attract millions of views every day from fans around the world. To satisfy global demand, the Gummibär songs and videos have been released in as many as 24 different languages, and still counting. The launch of the new Spanish language website, http://www.ositogominola.mx/, is yet another way for Gummybear International to meet global demand, by connecting to Gummibär’s growing fan base in Central and South America. Gummibär, or as he’s nicknamed in Latin America, Osito Gominola, already has several videos and songs that have been released in Spanish. Now, Spanish speaking fans have their very own website, complete with a bright, warm and colorful design. 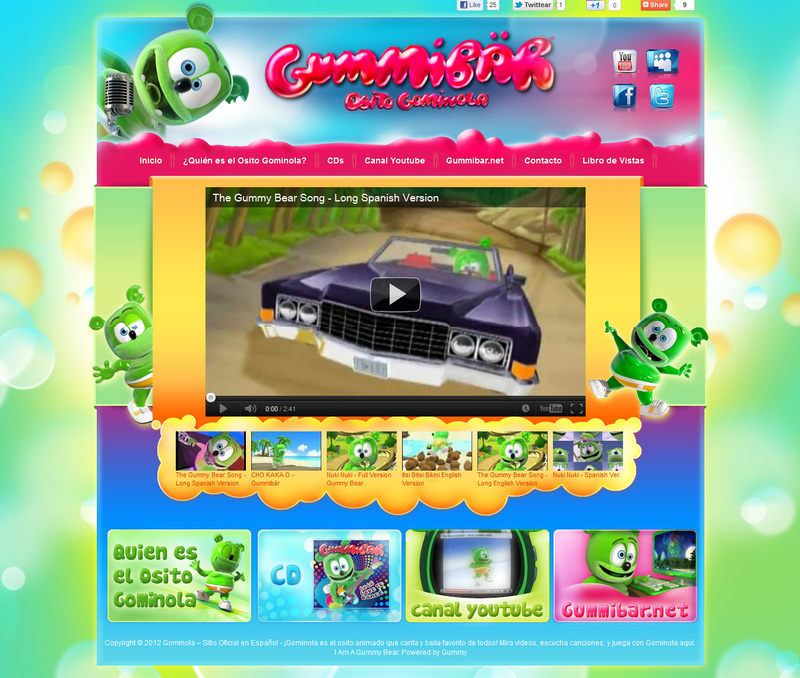 The site features all of Gummibär’s Spanish videos and songs, which fans can stream for free. Fans can also find links to iTunes and Amazon to purchase music, links to the official Gummibär social profiles on YouTube, Facebook, Twitter and Myspace and a guestbook to leave comments. Of course fans can still navigate to Gummibär’s flagship website, www.gummibar.net, to get full access to all merchandise in the webstore, the official newsletter, fan videos and more.